It finally happened. We got the snow the boys had been longing for so badly a week ago. We only got around 5 inches, but it was packed and hard, perfect snow for sledding. 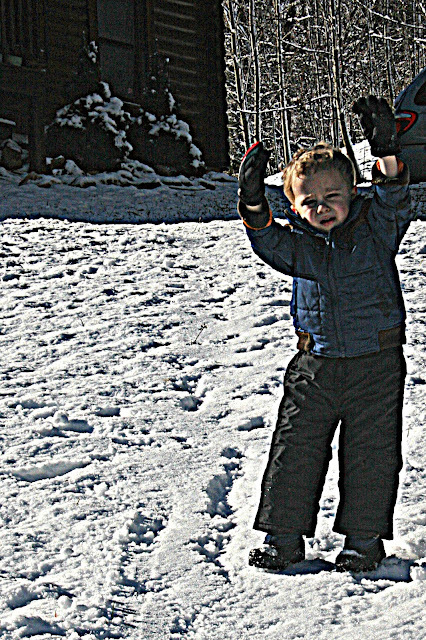 Pierce had a great time sledding. 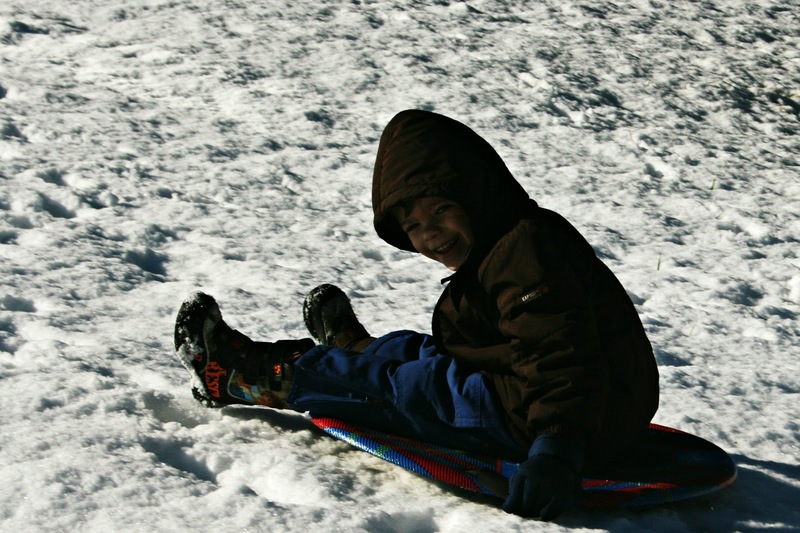 Every time he sledded though, Cort screeched in horror. He was scared Pierce would get hurt. Then Cort wouldn't even let Reid get NEAR the sled. Poor Reid. He had to watch from a distance. But he didn't seem to upset about it. Even though his hands got cold because he refused to wear his gloves. 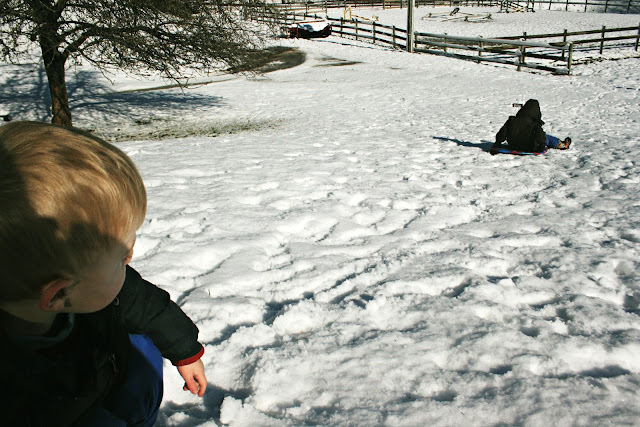 After Cort successfully shoved down Reid twice, averting him from the horrific sled, he stood at the top of the hill and screamed at the rest of us. COME ON GUYS. I DON'T LIKE SNOW. I WANT TO GO INSIDE. 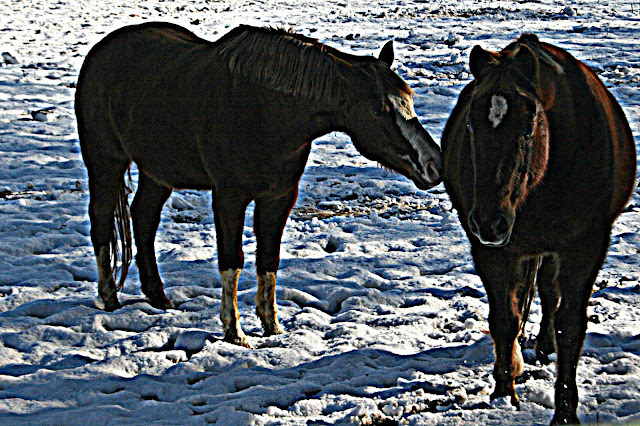 Mean mom that I am, I made him walk down to check on the horses with me. Sometimes they get balls of snow in their hooves, which is painful for them. They didn't have any snowballs this time, so I just gave them some hay to munch on. Looking at those tubby bellies, I probably didn't even need to do that, ha ha. And then I decided to call it a day. We all went inside to eat macaroni and cheese for lunch. At least two of them had fun! Cort's expression reminds me of something my uncle Meyr would say: "Oy Vey, what's wrong with you people!" Snow is fun! At least y'all have it! I know a third boy that would love to have played with your guys. That Cort is a man after my own heart :-) HATE snow!!!! I don's like snow either! Two out of three - is good. Oh good lord -- how do you do it girl? I had to laugh at your photos. Sorry. That last shot made me lol. Hope the remaining 2/3 enjoyed their time in the snow. Cute story. Your boys look like they're having so much fun! The storm just missed us, we were suppose to get 3-6" and ended up with a dusting! Luckily my son was able to play in the surprise 2" we had Thursday morning! Poor Cort.... not everyone is a snow bunny I guess. I probably would have been right there beside him yelling the exact same thing.. Let's go inside!!!! poor boy was so stressed! I agree with Cort! I don't like snow either...Although, I find it sweet that he was afraid of Pierce getting hurt. 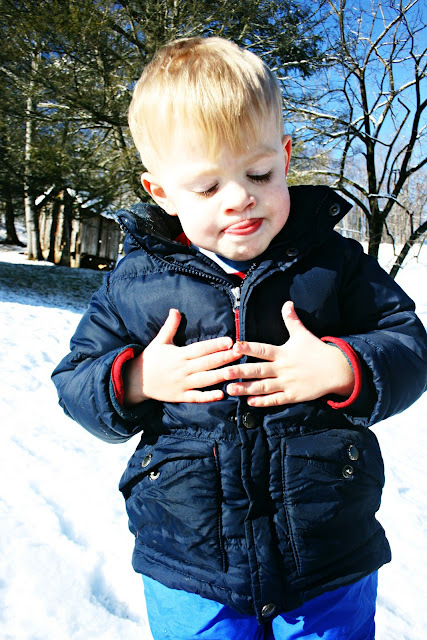 We often played until our hands were so cold we couldn't unbutton our coats hardly. Yes, two outta three ain't bad! Haha, poor Cort. Glad the horses were comfy. Lisa, hey! I'll gladly give you about 13 inches of our 18 inches anyday, and twice on Sundays. Too much snow here. Well first, we live very close, and yet we did not even get an inch!! These pictures are a SCREAM!! Hey, I made a double entende! It is really Cort who makes the whole blog today! And the pictures would not be half as good without his grumpy complaining. In years to come, this will be a wonderful and funny memory! He just tickles me to no end with his quirks! Awe too bad he does not like snow. We have had it off and on for a bit. We need a good snow so I can make a snowman with my grandson. Adorable photos and glad you got some snow. All we got was ice. That is hilarious! 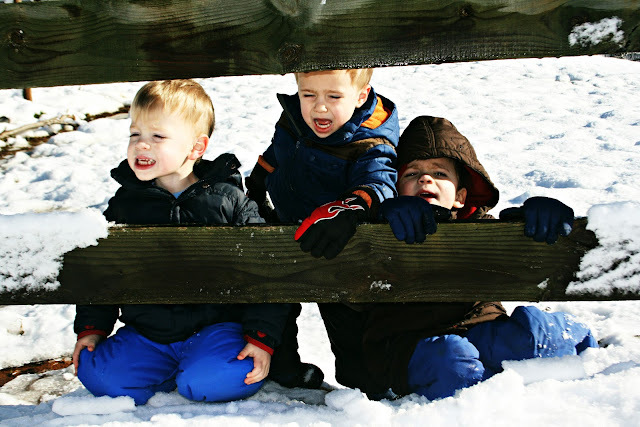 My kids love the snow. We only got a dusting. Two out of three isn't bad! I love that last picture. This story reminds me of our old neighbor girl who was terrified of GRASS. In the whole neighborhood. No idea why. Despite the tears, that looks like so much fun! What a great place to be a kid! Hooray for a snow day. Nothing brothers getting along....not! Those are some of the cutest pictures ever! I loooove the snow, LOVE IT! We didn't get any this year, maybe in the next month??? Last year we got a bit in Feb & even a dab in March so who knows. That's funny--there is always somebody who is not happy! UGH. The snow is lovely! We still haven't gotten much this winter. I'm coming over to sled, okay? ?